Innovation Contest winners Samer Dessouky, left, and Jim Stewart, center, talk with ILC member and Disney Imagineering VP Mike McCullough. If the ASCE Grand Challenge can seem daunting, then the ASCE Innovation Contest provides hope. 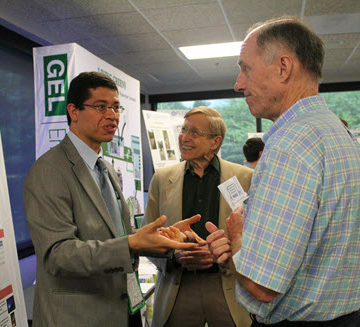 ASCE welcomed the winners of the Society’s second annual Innovation Contest to its headquarters in Reston, VA, for a two-day event designed to provide a platform for showcasing their ideas. The level of creative energy and ambition in the HQ building was palpable. ASCE’s Industry Leaders Council debuted the Innovation Contest last year as part of the Society’s Grand Challenge initiative to significantly enhance the life-cycle performance of infrastructure by 2025. As the need for infrastructure investment has increased, the available funding has decreased. To close that spending gap, innovation will be essential. 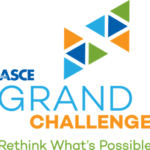 “The Grand Challenge is about changing the culture,” said ILC member Marc Hoit, Ph.D., F.SEI, F.ASCE, professor and vice chancellor for information technology at North Carolina State University. The contest event included category winners from both 2016 and 2017. They presented their ideas formally, discussed their concepts informally with like-minded innovators, and displayed visual representations and prototypes in an exhibit space. The winning concepts varied in scope and scale. Some, like the Ocean Foresters’ “Global Food and Energy Security With Restorative Engineering,” aim big – using seaweed to combat climate change. Others, like the father-daughter team of Robie Bonilla-Gris and Catalina Nadeau-Bonilla’s “Anti-Scour Sheath,” address a specific need and may be closer to market-ready. The common threads were an ability to solve a problem and the integration of different civil engineering disciplines and ideas. 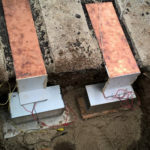 Larry Stolarczyk drew on a background in biology, electro-magnetics, electrical engineering, and theoretical physics to develop patented technology that uses AM radio waves to view subsurface utilities. His breakthrough won the contest’s Overall Greatest Impact on Delivering the ASCE Grand Challenge Award. 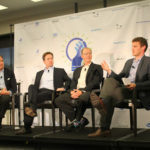 The Innovation Contest event also included a tour of Northrop Grumman’s Center for Innovative Solutions in McLean, VA, as well as a Shark Tank 101 panel. High-level investors Mat Garver (Liberty Street Capital), Matthew McGrath (Optimize Capital), Mark Riser (Morningside Private Investors), and Jed Freedlander (Hunt Development Group) provided insights into how innovative ideas are brought to market and what they look for when making investments. 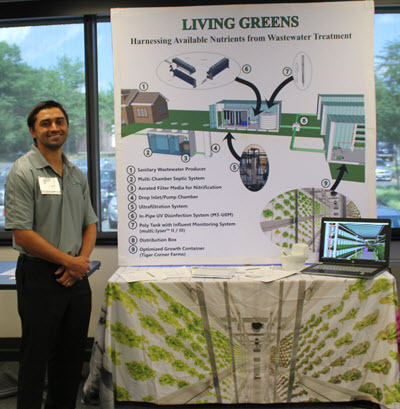 Innovation Contest honoree Andrew Cardella, EIT, A.M.ASCE, showcased his “Living Greens: Harnessing Available Nutrients from Wastewater Treatment” innovation in the exhibit hall. The second Innovation Contest closed with a look ahead to the third iteration. New contest chair Hoit announced that the third contest will open later this year, with topic categories including innovative business models, the Internet of things, sustainable engineering, next-generation transportation, and a new category: ASCE’s role in innovation. “How do we take something that’s been bugging people in civil engineering and turn it into something that’s able to be implemented, something that’s able to be turned into a product to revolutionize our field?” Hoit said. Watch for details on the opening of the third contest at its official site. What are the categories for the upcoming contest?